24-hour forecast: Mostly sunny today and partly cloudy tonight. Showers will be isolated except for the chance of an afternoon thunderstorm inland and a few showers over the south tonight. Today E 5-15 kts Light Chop-Choppy 1-3 ft A FEW SHOWERS MOSTLY SOUTH. Tonight E 10-20 kts Choppy 3-4 ft A FEW SHOWERS MAINLY SOUTH. Tomorrow E 5-15 kts Light Chop-Choppy 1-3 ft MAINLY FAIR WITH ONLY ISOLATED SHOWERS. Outlook E-NE 10-20 kts Choppy 3-4 ft A FEW SHOWERS SOUTH. A weakening stationary front is over E Cuba from 21N77W to 20N79W. 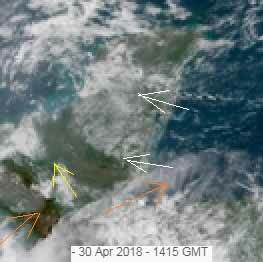 Scattered moderate convection is over E Cuba. This boundary will slowly dissipate through Mon. Atlantic high pressure will maintain fresh trades across the entire area south of 17N, with locally strong trades over the S central Caribbean along the north coast of Colombia through Thu. The southern portion of a broad inverted trough will move into the eastern Caribbean Thu, and reach to south of Hispaniola on Fri. Expect a surge of fresh to locally strong E to SE winds in the wake of the trough along with scattered showers and thunderstorms possibly impacting the eastern Caribbean, the Lesser Antilles and Puerto Rico towards the end of the upcoming week. On Ambergris Caye this morning the sea around our barrier reef is calm and the breeze is from the East at 8 mph. The expected high for today is 88 f.
Typical easterly Caribbean winds forming lines of white clouds, already heavier than normal, producing a few very small rain showers. The high level cloud is over Toledo and causing some rain over the Sarstoon. There is much greater activity out over the Pacific, that could effect Guatamala this afternoon. Looks like today will be mainly cloudy with sunshine, and a small chance of a little rain, could be more this evening. 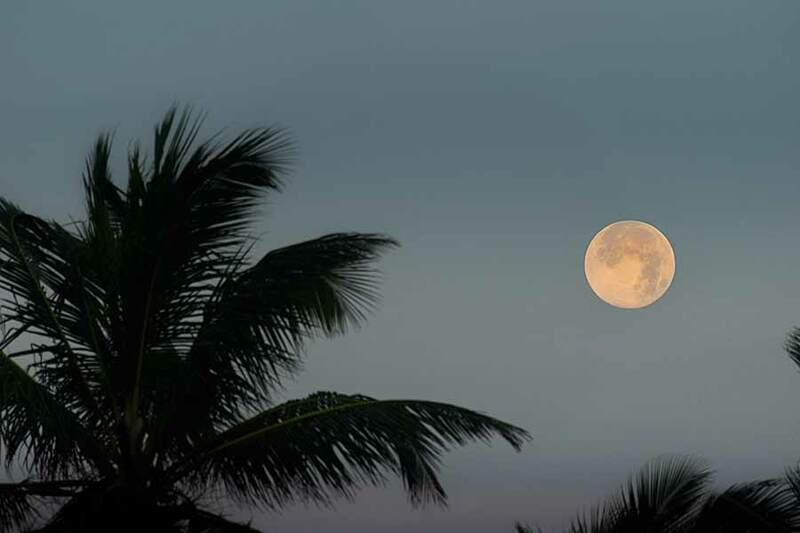 APRIL IN BELIZE IS THE DRIEST MONTH OF THE YEAR. THE FIRST TWO DAYS OF APRIL 2018, WERE WARM, BUT NOT COMPLETELY DRY. ISOLATED SHOWERS WERE OBSERVED OVER THE NORTH AND SOUTH OF THE COUNTRY. THE THIRD DAY WAS DRY. NO RAINFALL FELL! DURING THE FOLLOWING THREE DAYS ISOLATED SHOWERS AND ISOLATED THUNDERSTORMS WERE OBSERVED AND MOSTLY OVER THE MAYA MOUNTAINS. FROM THE SEVENTH TO THE NINTH, NO RAINFALL ACTIVITY WAS OBSERVED AROUND THE COUNTRY. FROM THE TENTH TO THE FOURTEENTH, AN INCREASE IN PRECIPITABLE WATER AND HIGH AFTERNOON TEMPERATURES SUPPORTED ISOLATED TO A FEW SHOWERS AND THUNDERSTORMS OVER THE MAYA MOUNTAINS AND OVER THE TOLEDO DISTRICT. 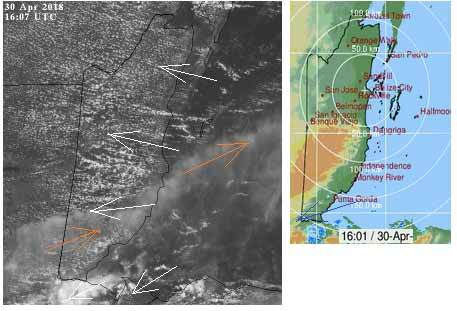 ON THE FIFTEENTH MORNING, PRE-FRONTAL ACTIVITY SUPPORTED SEVERAL OUTBREAKS OF SHOWERS AND THUNDERSTORMS. SEVERE THUNDERSTORMS AFFECTED NORTHERN DISTRICTS AND CAYES. 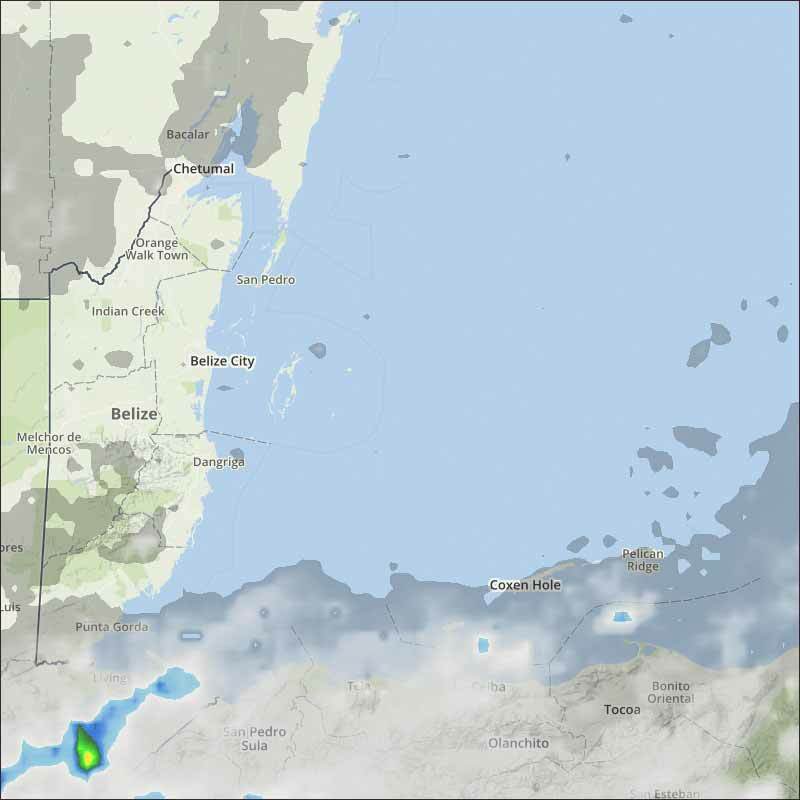 THE COLD FRONT CROSSED THE COUNTRY DURING THE FIFTEENTH NIGHT, BECOMING WELL ESTABLISHED SOUTHEAST OF BELIZE ON THE SIXTEENTH. ONLY ISOLATED SHOWERS WERE OBSERVED THAT DAY. THE SEVENTEENTH DAY WAS DRY WITH NO RAINFALL ACTIVITY. HOWEVER, ALL REMAINING DAYS TO THE END OF THE MONTH WAS A RAIN DAY. SOME DAYS WERE AFFECTED BY HEAVIER AND MORE INTENSE RAINFALL THAN OTHERS. THE TWENTY-SEVENTH AND TWENTY-EIGHT FOR EXAMPLE WERE AFFECTED BY PRE-FRONTAL ACTIVITIES WITH SEVERAL OUTBREAKS OF SHOWERS AND THUNDERSTORMS, SEVERE AT TIMES. OVER AN INCH OF RAINFALL WAS RECORDED AT SOME STATIONS IN THE CENTRAL REGIONS OF THE COUNTRY, ALONG WITH HAILSTONE ACTIVITY. THE ASSOCIATED COLD FRONT DID NOT CROSS THE COUNTRY. HIGH PRECIPITABLE WATER AND HIGH AFTERNOON TEMPERATURES SUPPORTED ISOLATED TO A FEW SHOWERS AROUND THE COUNTRY ON THE OTHER DAYS. IN CONCLUSION, APRIL 2018 WAS NOT TOTALLY DRY. THERE WERE ONLY EIGHT DAYS WITH NO RAINFALL ACTIVITY. MEASURING RAINFALL READINGS ALONGSIDE THE CLIMATOLOGICAL NORM SUGGESTS THAT RAINFALL WAS ABOVE AVERAGE IN BELIZE FOR APRIL 2018. HOWEVER, TEMPERATURES, MAXIMUM AND MINIMUM WERE WITHIN THE NORMAL RANGE. IN ADDITION, ONE COLD FRONT CROSSED THE COUNTRY THIS MONTH AND WAS A CONTRIBUTOR TO THE ABOVE NORMAL RAINFALL.